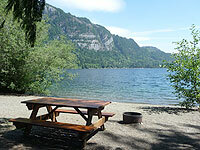 After operating Horne Lake Regional Park under an interim management plan in 2002, a Five Year Management Plan was developed for the campground in 2003. Challenges with meeting the operations demands over the short 5-year timeframe of the 2003 plan led to the current revised plan. The Regional Board approved the revised Management Plan in November 2005. The vision and goals for Horne Lake Regional Park carried forward from the 2003 plan, with elaboration on various policies within a new operational framework. The Management Plan provides for the operation and development of the Park for the 2006 - 2025 period. See the full Management Plan in the Quick Links section to the right.